Colonel Commandant), 3 Tpt Association Office Bearers, Ladies and Gentlemen. Thank you for according me the honour of providing the Commemorative Address on the occasion of the Dedication of a Commemorative Plaque to those who have served in 3 Company. A dedication such as this must recognise the deeds of those who have gone before, the current achievements of those who serve today and perhaps even a fleeting consideration of what the future may hold – in this way a tangible and valuable link is maintained. I doubt that any member of the Company who served overseas in the First World War or Second World War could have ever allowed themselves the thought that one day their service would be recognised in the shadow of this magnificent structure we know as the Australian War Memorial. 3 Company’s war service reflects the diversity of commitment during the First and Second World Wars. In the First World War – the Coy spent time in Eygpt for training and preparation, service at Gallipoli – predominantly in supply areas around the beaches at Gallipoli, subsequent reconstitution in <?xml:namespace prefix = st1 ns = "urn:schemas-microsoft-com:office:smarttags" />Alexandria and significant support within the 1st Division on the Western Front from 1916 – where railhead clearance and onward transport was the primary task. We know that support was provided in a rudimentary manner – some motorised transport but with a reliance on horse and wagon and for some elements even mules. The provision of service support in rear areas belies the risks faced and the dangers endured by these men – whether on the beaches at Gallipoli or moving supplies forward on the Western Front – Australian Army Service Corps personnel were subjected to artillery fire and small arms fire on a regular basis. 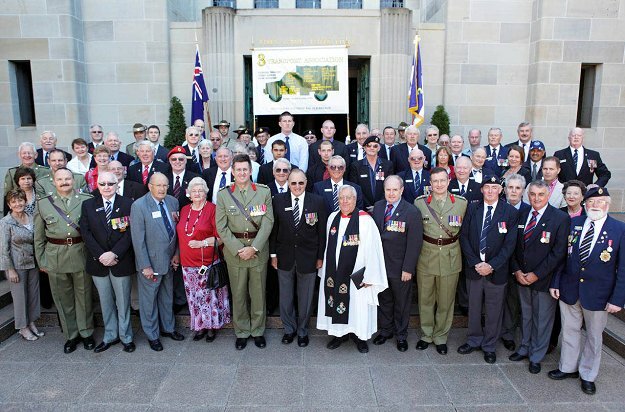 In 1942, 3 Company elements then serving in North Africa was re-established from the AASC elements of the 6th Division and returned to Australia at a time when much of the population felt vulnerable to Japanese invasion. For just on a year the Company provided transport support in the Northern Territory by clearing supplies from the railhead at Alice Springs to troop concentrations and airfields further North. Having driven not dissimilar routes more than 20 years ago in modern vehicles, albeit without air conditioning, one can only admire the resilience and toughness of the men in 3 Company who, mixed with a degree of ingenuity, kept vehicles going for that length of time in those conditions. From mid 1943 3 Company was prepared for service in New Guinea and in 1944 as part of the 6th Division the Company provided transport support along the Northern coastal road and barge unloading as a precursor to the push on Wewak in the latter part of the War. The operations in New Guinea reinforced the challenges of a demanding environment and the availability of basic motorised transport. Again the soldiers of 3 Company met these challenges and provided essential transport support. The post World War 2 service of 3 Company highlights the resilience of what we know as the Army Reserve today. During numerous reorganisations the Company maintained and continues to maintain essential support to Reserve units. This contribution has been underestimated in many respects – countless Reservists have pursued full time careers on the basis of their Reserve experience, soldiers in 3 Company – and its many subsequent organisations – provided a contingency option for Defence and Government at minimal cost and, perhaps glimpsing the future, members of 3 Transport Squadron now serve overseas on training or operational deployments and assist in domestic support tasks like the Victorian Bushfire relief effort. Through this abridged version of a proud history some enduring themes emerge – 3 Company soldiers proved themselves “Equal to the Task” in a variety of operational situations – their work was essential but went largely unheralded, they proved to be adaptable and resilient and a collective spirit persisted through numerous reorganisations. That some 95 years after formation we are here today to commemorate the service of thousands of individuals with a link to 3 Company reinforces the value of that service and the ties that remain. the Association, while rightfully acknowledging the past, continues to support the soldiers of today and those who follow. May all of you continue to prove to be - Equal to the Task. Almighty God, whose command is over all, and whose love never fails, Let me be aware of your presence, and obedient to your will. Help me accept my share of Responsibility with a strong heart and a cheerful mind. Make me considerate of those with whom I live and work. And faithful to the duties my country has entrusted to me. Let my uniform remind me daily of the traditions of the Army, in which I serve. When I am inclined to doubt strengthen my faith, when I am tempted to sin, help me resist. When I fail give me the courage to try again. Guide me with the light of your truth and keep before me the life and example of Jesus. In whose name I pray. and laid down their lives for their friends. in the perfect unity of love, one God, now and for ever.